Bugling elk, running coyotes, lots of bear sign, ripe huckleberries, and a prehistoric landscape. From the Trailhead, only 5 1/2 miles north of the Mt. St. Helens Crater, I could see my destination, Coldwater Peak. It was a sunny, clear day providing views of the growing lava dome inside the old crater, the pumice plain and landslide deposits. The forest that once covered the area is long gone with ghostly white and grey remnants of the old trees evident in every direction. The Trail provides many views of Mt. St. Helens, Spirit Lake (where Harry Truman refused to leave his Lodge and died in the blast), Mt. Adams, Mt. Hood, St. Helens Lake (home of many logs from trees destroyed by the pyroclastic flows from the 1980 eruption) and Mt. Rainier. In many ways the scenery is reminiscent of a Moon landscape. A few trees are growing, but the land is many centuries away from returning to its previous green splendor. It is a truly unique and amazing environment to meander through. Spectacular photos, John. Thank you for sharing your love of such beautiful places. Thanks Debbie. 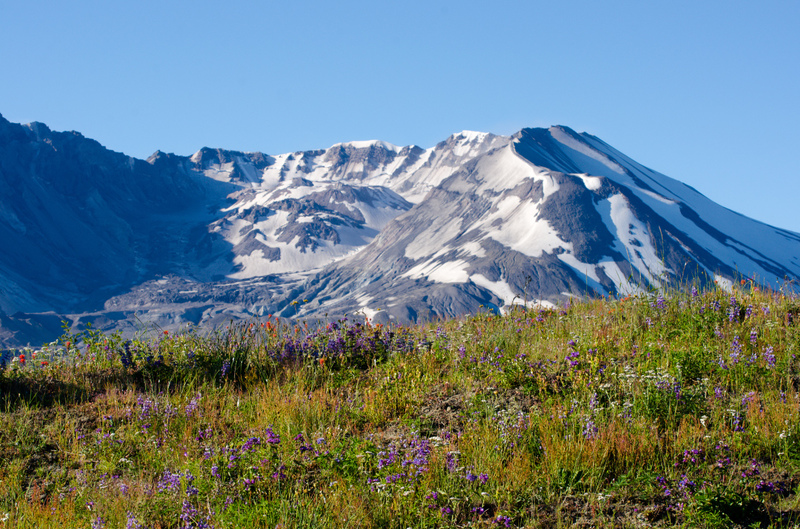 I enjoyed the photos of the Burroughs Mountain hike from your Mt. Rainier trip too. I have Coldwater Peak and Burroughs Mountain as candidates for the “Bucket List of Pacific Northwest Alpine Hikes”. Everyone should do them both, at least once. John, your photos capture the beauty of Coldwater Peak and the creatures you saw. It inspired me to get out West again. I would love to see Mount St. Helens in person. Thanks for the kind words. It is a spectacular hike indeed.